Developed by Newell-Murdoch, this residence park neighborhood's first house was completed in 1914. Constructed: 1912-1913, with first house completed in February 1914. A few seconds of damaged newsreel footage of Forest Hill from the 1920s, courtesy of Jack Tillmany. Digitization courtesy of the San Francisco Media Archive. In 1910, twelve years after his death, Adolph Sutro's estate was finally coming out of probate. His heirs employed A.S. Baldwin, the well-known real estate agent from Baldwin & Howell, to do a formal assessment of Sutro's extensive properties. Baldwin took matters into his own hands by forming a corporation to purchase the lands directly from the Sutro heirs, and sell subdivisions for the creation of residence parks like the successful Presidio Terrace in the Richmond district. 2 One of the first properties sold by the Residential Development Corporation was cut from the forest tract Baldwin liked so much. Newell-Murdoch deeded 21 building lots to the City of San Francisco free of cost in October 1912 to build the Laguna Honda subway station. 6 Like other developers and investors in the Sutro lands, the company was betting that the Twin Peaks Tunnel, and its promise of a quick commute downtown, would create a boom in sales. Newell-Murdoch aggressively promoted the property with photos, newsreels, flyers and promotional booklets. Every Saturday the real estate sections of the San Francisco Call, Chronicle and Examiner featured an advertisement, photo, or promotional article. Famed architect Bernard Maybeck designed two homes and the community clubhouse in Forest Hill in this time. In 1918, the tunnel had opened but American entry into World War One had real estate sales stagnating. Homeowners in Forest Hill weren't very pleased with the streetwork and utilities in the development, which had been laid out quickly and didn't meet city standards. 7 The residents formed a corporation, the Forest Hill Association, and made a deal with Newell-Murdoch to take over the entire tract. 8 (In 1978, the City of San Francisco relieved the Forest Hill Association of responsibility for the streets and curbs.) Newell-Murdoch faded from the scene and the majority of today's homes in Forest Hill were built and sold in the 1920s and 30s by the Lang Realty Company, who had developed Balboa Terrace. Forest Hill integrated in the 1960s, as prominent African-Americans such as Willie Mays and City Supervisor Terry Francois (who had acted as the local head of the NAACP) made their homes in the community. Today there is a significant Asian population in the tract. 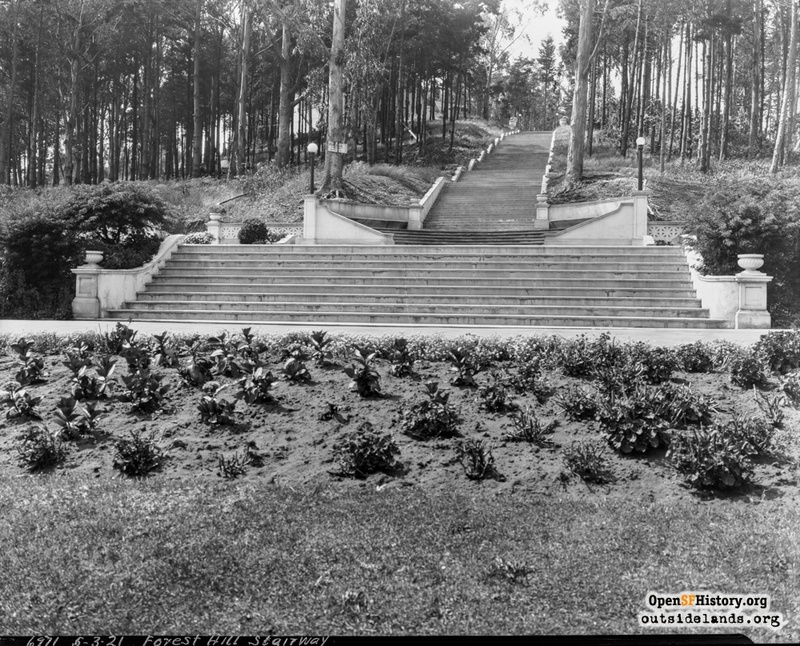 Images: 1) "This Sylvan Solitude Was Only Eight Blocks from Golden Gate Park and Was in the Geographical Center of San Francisco's Residence Section at so Recent a Date as June 15, 1912." from Newell-Murdoch promotional pamphlet, The Story of Forest Hill. Reprinted by the Forest Hill Association, n.d. (Courtesy of Richard Brandi). 2) Newell-Murdoch ad from San Francisco Chronicle, October 1912. 3) "The San Francisco Commercial Club Visits Forest Hill, April 18, 1913. Compliments of Newell-Murdoch Company." (Courtesy of Richard Brandi). 1. A.S. Baldwin, Estate of Adolph Sutro, Deceased, March-April-May 1910. "Forest Tract", pg. 34. California State Library, Sutro branch. 2. San Francisco Chronicle, February 18, 1911, pg. 12. 3. San Francisco Call, June 8, 1912, pg. 19. 4. "Extensive Work at Forest Hill", San Francisco Call, November 16, 1912, pg. 13. 5. 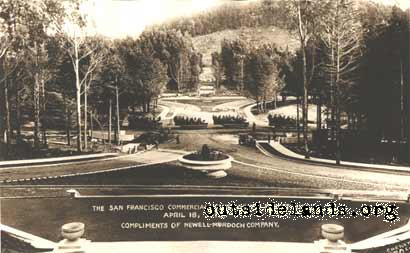 Newell-Murdoch Company, "Forest Hill, San Francisco" pamphlet, n.d., pg. 4. San Francisco Heritage. 6. "City Receives Gift of Lots at Tunnel", San Francisco Call, October 20, 1912. 7. "An Island of Tranquility Amidst Big City Turmoil", San Francisco Examiner, January 11, 1971, pg. 6. 8. "Forest Hill Park to Be Managed by Property Owners", San Francisco Chronicle, September 21, 1918, pg. 14. 9. San Francisco Examiner, January 11, 1971, pg. 6. 10. San Francisco Examiner, January 15, 1972, pg. 3.